﻿ 2018 has a strong start in the world of symphonic metal with the release of Leaves’ Eyes’ seventh studio album. Their albums are renowned for their Nordic historical influences – 2004’s Lovelorn explored the magical world of a mermaid, followed shortly after by Vinland Saga in 2005 that focused on the Vikings. 2009 saw the release of Njord which delved into tales of medieval mariners, with Meredead released in 2011 that tells of ghosts in the marine world. Symphonies Of The Night in 2013 focuses on heroic women of the past centuries, followed by 2015’s King Of Kings, written about the first king of Norway. They are a talented band, able to merge heavy instrumentation from the guitars seamlessly with operatic vocals and Nordic melodies. April 2016 saw a change in line up for the band with Finnish vocalist Elina Siirala replacing Liv Kristine. Sign Of The Dragonhead will be the first studio album featuring the new singer, however her excellent performances at Metal Female Voices and Masters Of Symphonic Metal along with many others have already proven her position. The album continues Leaves’ Eyes unique sound and Elina’s vocals work with it effectively, although her vocals are significantly different to Kristine’s gentle soft tones, with a slight edge to her voice. They are both talented vocalists, though it may take a couple of listens for those familiar with Liv’s vocal style to adjust to Elina. The title track opens the album with atmospheric percussion and choral vocals, before exploding into heavy guitar chords and contrasting melodies that build up a large sound. This is a strong opening to the album as it displays Elina’s vocal abilities. She has a wide vocal range and sound control over her voice, able to sing at a fast paced in the operatic style. It is evident from this track that they work effectively as a band; the vocals do not feel distant or incohesive with the instruments. The second track of the album Across The Sea portrays the band’s skills with reflecting the theme of a track in its instrumental layers. The track contains pirate-like motifs in the orchestral instruments and guitar riffs. The fast pace of the chorus portrays fast movement of a ship across the sea. Rulers Of Wind And Wave, an instrumental track, clearly displays the band’s merge of Celtic folk and heavy metal, including the use of instruments such as medieval nyckelharpas, fiddles and uilleann pipes, with the added effect of storm sound effects. With another epic album from Leaves’ Eyes it is evident they are growing from strength to strength, able to develop their sound but without losing their identity. Even with the recent change in line up, the band work cohesively without compromise to their sound, making for an undoubtedly fantastic album to experience live. 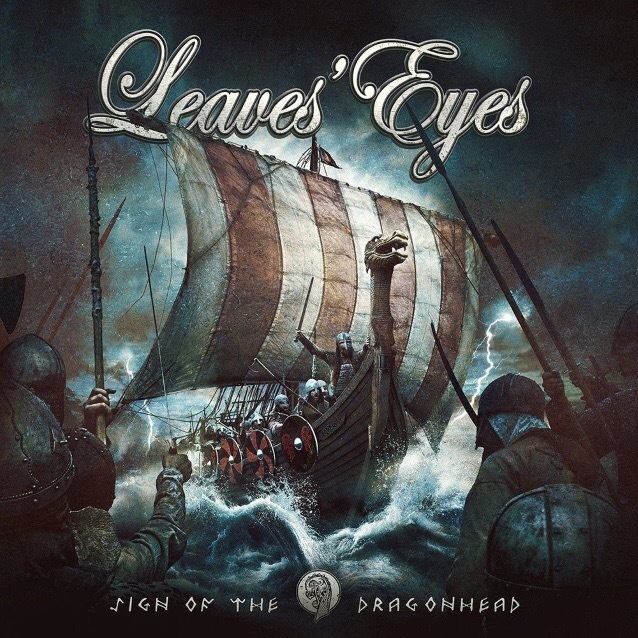 ‘Sign Of The Dragonhead’ by Leaves’ Eyes is released on 12th January on AFM Records.